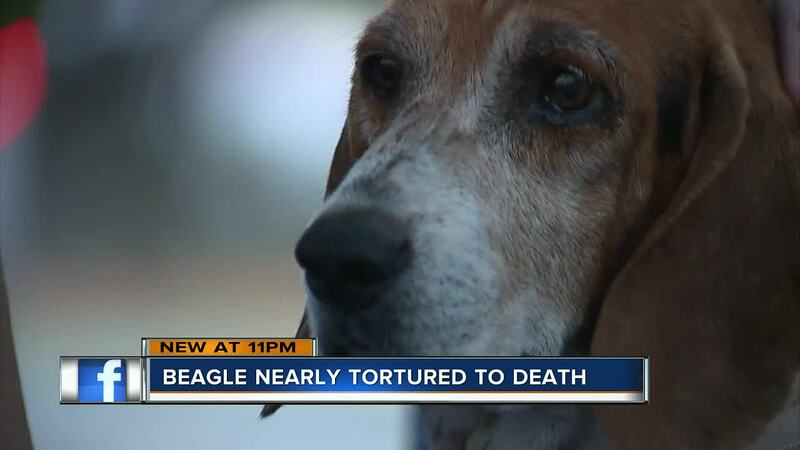 The horrific act of violence done to an elderly beagle named “Max” is so severe it’s bringing tears to the volunteers tasked with saving his life. FROSTPROOF, Fla. — The horrific act of violence done to an elderly beagle named “Max” is so severe it’s bringing tears to the volunteers tasked with saving his life. The beagle was found wandering on Dec. 11 near a home on the 500 block of Otto Polk Road in Frostproof. A good Samaritan cleaned Max’s wounds and then called Hardee Animal Rescue Team (HART), a non-profit based in Wauchula, to save his life. Max also has a six-inch gash near the back of his neck that looks as though someone took a machete or a butcher knife and slashed it open. The wound is so severe the skin peels down Max’s back. The non-profit is offering a $500 reward for information on who hurt Max. The good Samaritan that called the non-profit for help said she would adopt Max. Doctors say the beagle isn’t out of the woods, but he is a fighter. For more information on how you can help Max and other dogs click here.